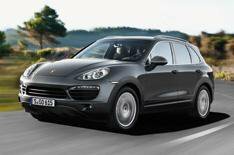 2013 Porsche Cayenne Diesel S review | What Car? The latest Porsche Cayenne has been available with a 3.0-litre diesel engine since launch, but some buyers felt this didn't offer the performance a Porsche should. That's where this new S model comes in. It's powered by a 4.2-litre twin-turbo V8 diesel that develop 377bhp, compared with the V6's 247bhp. However, it's the V8's 627lb ft of torque that really impresses - even the most powerful turbocharged petrol Cayenne only offers 516lb ft.
Whats the 2013 Porsche Cayenne Diesel S like to drive? The engine is not only a powerhouse, but also one of the most refined diesels we've ever tested. At tickover theres only a negligible amount of mechanical chatter, so its almost impossible to determine whether youre burning diesel or unleaded fuel. Then when you put your foot down, youre simply greeted by a slight change in the attitude of the bonnet and a deliciously deep V8 burble as you thunder up the road. Sitting aboard two and a quarter tons of Cayenne while storming to 62mph in less than six seconds is something to behold. Whats more, the power just keeps on building at a ferocious rate as the engine slices through the rev band, before the slick eight-speed auto box selects another gear and the car continues its relentless quest to destroy the speedometer. The way the Cayenne manages to disguise its substantial weight when the road turns twisty is every bit as impressive. Thanks to sophisticated suspension, four-wheel-drive traction and clever electronics that limit roll, dive and pitch, the Cayenne scythes through corners faster than any SUV has a right to - especially one that rides this well. In fact, the only downside to driving the Cayenne Diesel S is when cruising on the motorway, where the fat tyres generate a fair amount of drone and theres some whine from the axles and differentials. Whats the 2013 Porsche Cayenne Diesel S like inside? Its almost impossible not to be blown away by the glamour and complexity of the Cayennes dashboard. The dials and switches are startling and confusing in equal measure. You could spend all day playing and not get to the bottom of the functionality of it all. Still, thats a task wed willingly undertake. The immaculate fit and finish and exemplary quality of the materials are far more identifiable, and if any manufacturer is making a higher-quality interior, weve yet to see it. Despite the Cayennes sheer size, though, and its ability to carry five and their luggage, the cabin does feel quite snug. The prominent centre console that divides the two front seats is imposing and a bit restrictive, while the windows are on the small side, so the cabin ambience is rather dark. Obviously, for this kind of money youd expect plenty of toys; the Cayenne has eight-way electrically adjustable seats, dual-zone climate control, cruise control, front and rear parking sensors and an audio system with a seven-inch display screen. The Cayenne Diesel S costs around 12k more than the V6 diesel and averages 5.2mpg less, but if you've got the money and want the best performance SUV on sale, it's the one to have. The Diesel S delivers astonishing mechanical refinement and feels every bit as fast as the V8 petrol models, yet you won't have to keep stopping every five minutes to fill it up; theoretically at least, it can cover around 745 miles on a tank. It really does offer the best of both worlds.